After Saturday’s loss to the New England Patriots, one thing was crystal clear. 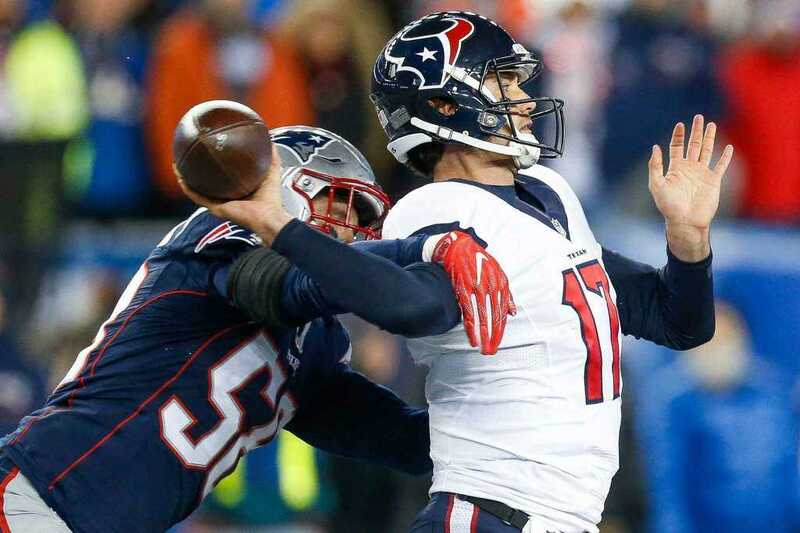 The Houston Texans’ offense is stopping this team from ever competing for a Super Bowl. This game was winnable if the Texans had even a mediocre showing on offense. Nearly everything needs to be changed. Obviously, Brock Osweiler is the key problem. There’s nothing to add to this. I don’t know that there’s even a possibility of him having upside. We now have the most expensive backup quarterback in the NFL heading into the 2017 season. There will be a competition to see who starts at quarterback going into next season. Brock Osweiler, Tom Savage, and whoever they acquire during free agency and the draft will be on an even playing field. Play calling has been atrocious all season for the Texans. The second scapegoat, after Brock, seems to have been offensive coordinator George Godsey, who “mutually parted ways” with the Texans. Being the OC for the 29th ranked offense in the league doesn’t really leave much of an argument to be made, but this isn’t the only problem. Another key to reviving this team is adding depth to our offensive line. Left tackle Duane Brown missed a few games early this season. Second round rookie Nick Martin missed the entire regular season with an ankle injury. Derek Newton suffered a horrific injury mid-season against the Denver Broncos. 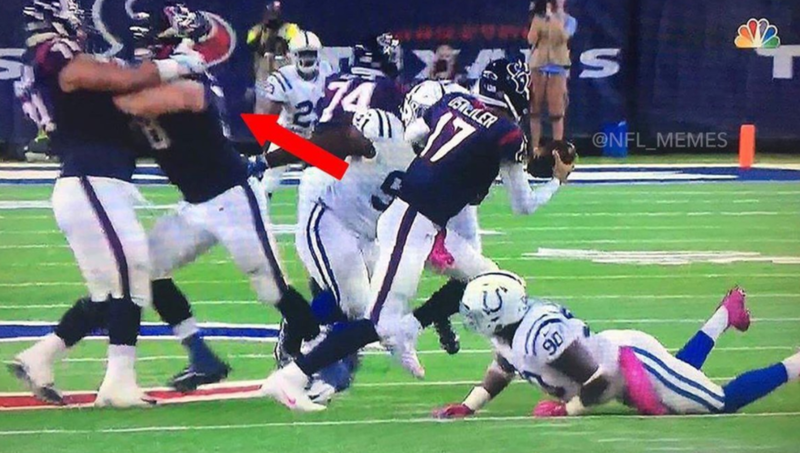 The only thing photo shopped in this picture is the red arrow pointing at two of our lineman blocking each other. The Texans hope to have Duane Brown and Nick Martin healthy for all of next season, but Derek Newton may need to be replaced after his extreme, possibly career-ending injury. The O line struggled at the guard position as well. This line will need an overhaul through free agency and the draft. It’s an absolute must. Lastly, the Texans need to bring in a veteran wide receiver. They have the youngest receiving corps in the NFL with DeAndre Hopkins being the lone veteran, and he still has upside at the ripe age of 24. We already have a guy in Will Fuller who can stretch the field, and an interesting slot receiver in Braxton Miller, but they’re young and inexperienced. They will take time to learn the intricacies of playing the position in the NFL, we need to obtain a veteran to fill in the gaps as the young guys grow. There’s a lot to address this offseason. All of the items listed above must be completed in order for this team to compete for a championship. We only have a small window where this dominant defense will remain largely intact, so Houston needs to work aggressively to fix the other side of the ball while it lasts.